100 million years ago the Hughenden region was part of a great prehistoric inland sea. The giant Muttaburrasaurus roamed the shore and the skies were ruled by mighty Pterosaurs. Today, Hughenden embraces the spirit of the outback like no other place and there’s not a dinosaur in sight. Well, not a real one, anyway. 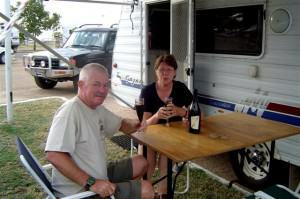 We arrived in Hughenden just before lunch and checked into the Allen Terry Caravan Park ([star][star][star]). Then it was off to town for a look around. The first thing you see when you drive down the main street is Mutt the Muttaburra-saurus. 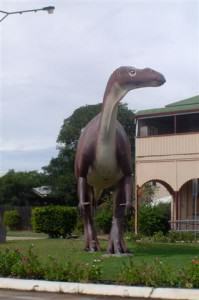 A life-sized replica of the dinosaur that was discovered in this area holds pride of place at the town’s main intersection. 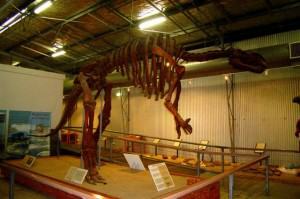 In the Flinders Discovery Centre there is a replica of the skeleton of the dinosaur, known as “Hughie”. The original bones were apparently too heavy to be housed here and are now in the Queensland Museum in Brisbane. This fibre-glass re-creation is most impressive and is an exact copy, right down to the smallest detail. Big! But was he friendly? Muttaburrasaurus wasn’t carnivorous but at 2 storeys high, 7 metres (23 feet) long, and weighing 40 tonnes (44 tons), he wouldn’t need to be. I wouldn’t like to meet him on a dark night . . . or even in the middle of the day! The history of Hughenden, the town, goes back to the late 1800’s but the prehistoric history is over a 100-million years. The first fossil to be discovered in this area was an Ichthyosaurus, found on the bed of the usually dry Flinders River in 1865. Over the years many more fragments of bone were recovered at various locations around Hughenden and in 1899 a piece of the jawbone of the giant Plesiosaur Kronosaurus was found. But it wasn’t until 1963 that fragments of the dinosaur Muttaburrasaurus were discovered near the town of, appropriately named, Muttaburra and even more fragments were found scattered, as recently as 1987, throughout the Hughenden area suggesting that the mighty Muttaburrasaurus may have had the widest range of any dinosaur in Australia. fossils, each superbly displayed in a glass cabinet. We wandered through the displays and watched an amazing show that took us back over 500-million years to the formation of Porcupine Gorge, one of the area’s premier attractions. The streets of Hughenden feature a series of sculptures from local artists, each one depicting something from the prehistoric past with just a touch of the outback thrown in. All are made from junk metal and the Federation Rotunda in Brodie Street is constructed from two 6-metre (20-foot) windmills. Under the Rotunda’s curved roof is some original bush furniture. But we discovered, as with most of the small country towns we’ve been to, Hughenden seemed to close down on Saturday afternoon. By 1:00 the town was all but deserted. About the only place left open was the pub. We didn’t want to go into the pub and we didn’t feel like a drive out to Porcupine Gorge, approximately an hour away, but in hindsight we should have. Known as Australia’s “Little Grand Canyon”, it boasts a clear flowing creek, towering cliffs of brilliantly coloured sandstone, and dense vegetation which is in striking contrast to the dry, flat plains that surround it and with only this one afternoon here, not seeing Porcupine Gorge was a mistake. Porcupine Gorge National Park is a hidden canyon north of Hughenden. Carved out over time, it reveals layers of basalt and coloured sandstone and we were sorry to have missed it. The township of Hughenden was established in 1876 and in 1887 the town began to grow as an important railhead for the Great Northern Railway. Today, Hughenden has a population of about 1200 and is surrounded by 4 national parks and a nature reserve. For our one and only night in Hughenden we decided on dinner at the Great Western Hotel. But before we left we toasted our arrival in Hughenden with our bottle of Two Tails Sparkling Wine. Well, our meal at the hotel was enjoyable and the evening very pleasant but this is not a town with a great nightlife and so we returned to camp for a relatively quiet evening. Perhaps one day we’ll return here and when . . . if we do, Porcupine Gorge is an absolute must-see.